Remember when I said the Good Book Club was going well for my family? That I was excited to be regularly sitting down with my teenagers at the end of the day, sharing highs and lows, reading the Bible, and praying the Lord’s Prayer together? It was true then. It’s not true today. During Lent my kids and I were pretty regular with the Good Book Club. We weren’t 100%, but we were probably 70%-80%. Although I originally planned that we would catch up with all readings we had missed every Sunday, that didn’t happen. I traveled for a week in early March. Strangely enough my teenagers did not sit down together before bed and do this routine without me. We never caught that week up, but we did jump right back in. We got all the way to Holy Week with fairly regular reading. And then… Holy Week happened. Early in Holy Week I lost the thread of the Good Book Club. There was a choir concert; I was wrapping up my role as editor of Grow Christians; I was overbooked. After a few days off, we got back to the Good Book Club on Maundy Thursday. And I couldn’t do it. On Maundy Thursday, after the evening service, I called my kids to read the Bible. And we opened up the app, and guess what: the Good Book Club had us reading the story of Christ’s resurrection. Call me a liturgical purist. Call me overly attached to the lectionary. Call me whatever you want, but I could not sit on the sofa with my kids and read about the resurrection of Jesus Christ on Maundy Thursday. It was the wrong day! I called off the Good Book Club for the rest of Holy Week. If this was Maundy Thursday, how would Good Friday be? I wasn’t worried about confusing my kids; they are old enough to know and understand the whole story. It was me I was worried about. I was disoriented, and I don’t want to be disoriented during Holy Week. Those sacred days are what orient my whole life. It’s fine, I thought, we can pick up the Good Book Club in the Easter season. But so far we’ve done precisely one of the Acts readings: the one for Easter Sunday. 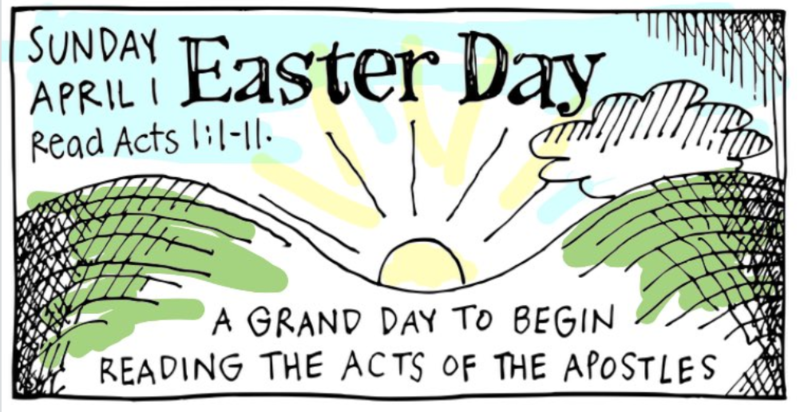 When we began, I told my kids “This is even more important, because you don’t know these stories.” But Easter Sunday coincided with the beginning of spring break. That meant a family trip which got us off our routine. Easter Week included sending my daughter off to the General Convention Official Youth Presence training (proud mom that I am) and myself off to the Province V Synod. It’s about to be the second Sunday of Easter. We’re behind again. Is this the Good Book Club experience I want for my family? It is not. And yet, it’s a symptom of our lives. We are not unusual in our zip code. We are not unusual in this Episcopal church. We are going too fast, with too many commitments, in too many places. A daily evening practice of Scripture reading and prayer doesn’t come naturally. It takes effort. And sometimes, even with effort, it just doesn’t happen. But our God is a God of forgiveness, mercy, and grace. So tonight, I’ll text my daughter and call my son. We’ll begin again. After all, that’s the story we find our place in: that God invites us to find ourselves in Him, and enables us when we fall short, to repent and begin again. How is the Good Book Club going for you? I suggested to my partner that we try adding the good book club to our nightly routine of Compline but she wasn’t interested. Maybe we’ll try again next year. We continued with Compline and haven’t missed any days for a long time. I’m grateful for that. My personal devotional schedule is pretty full and, short of joining a religious order, I couldn’t really add anything more anyway. But thank you for sharing your “failures” because I have them too. I feel bad when i “don’t get around to” part of my time with Jesus; I know when I rush through an office I’m not fooling God: it isn’t really Prayer. But knowing you struggle too makes me determined to keep on. You are an inspiration to me and I know God isn’t finished with me yet. I’m actually glad to hear someone else voice the disconnect during Holy Week. I, too, had to stop reading Good Book mid-week as it felt completely off. Will pick it back up with Acts, but will also read the daily readings, as I miss the rhythm of those. Nurya — I so appreciate your honest writing. There’s not enough of it in the world today. Thank you! Amen sister! The irony that our daily devotions can be interrupted by the grander doings of the Holy Week. Fall off….get back on! Peace! I got behind in my Forward readings right after Easter going into the Book of Acts. I spent some time on Sunday catching up for the week. It’s easy to fall behind but so very difficult to catch up. Thanks for sharing!